This is the essential reference companion to all who use German for business communication. Containing over 5000 words, this handy two-way A-Z glossary covers the most commonly used terms in business. It will help you to communicate with confidence in a wide variety of situations, and is of equal value to the relative beginner or the fluent speaker. 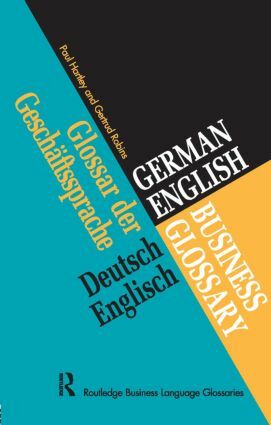 Written by an experienced native and non-native speaker team working in business language education, this unique glossary is an indispensable reference guide for all students and professionals studying or working in business where German is used.